In the past, the Bible has faced tests of originality, internal consistency, validity of some of its characters, recorded events and prophesies. For instance, some bible critics cast doubts over the veracity of the character of Melchizedek, the king of Salem who it recorded as a priest of most high God without father or mother. Gen.14:18-19. They also dismissed the parting of the red sea as most unlikely. Ex. 14: 21. And last but not the least, they considered as impossibility the idea that Christ ever walked on the water. Matt. 14: 25-26. But like steel that has passed through the test of fire, the bible has remained till date, unarguably, the finest of religious texts around and the most circulated too. Its many counsels and principles have proven to be a dependable source of strength and succor to millions of humanity throughout the ages. In recent times, however, soft biblical copy has become a reality with technological advancement which guaranteed flexible delivery of bible literature in addition to other scientific inputs that have continue to positively impact the growth of Christian faith. They come in downloadable forms from the Google play stores and other similar platforms. In some mobile devices, they come by default. This is in addition to other searchable online bible resources that are readily available for the use of all irrespective of their Geo-location. Incidentally, it has led to sharp disagreements among Christian faithful over its acceptability for worship and before God. Some traditionalists or hard line Christians believe the bible is most potent for worship and acceptable to God in its paper form. They frown at the idea of reading of biblical texts in soft formats through mobile devices at Christian meetings. To them, it’s a sign of disobedience to God’s commandment and proof we’re living in end times as predicted by the holy book. Above all, it’s to them an unforgivable apostate indulgence. There is also another group with a moderate view who believe it can be used anywhere else but the church. You might want to ask, what difference does it make? On the other hand are people with liberal perception of things and who’ve relatively higher adoption level for technological breakthroughs or inventions. Interestingly, this group also comprises the church leaders as well as the laity in equal proportion. 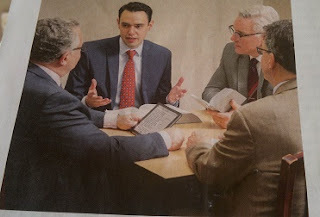 Many clergies can be seen these days ministering from the pulpit with a combination of some of the so called apostate devices and other not so apostate public address systems like hand held or hand’s free microphones, sophisticated sound systems, and computers with Internet connections for live streaming of church programs to the global body of Christ. And you cannot but agree that each is no less a product of advancement brought about by science and technology than the other. Similarly, we’ve congregation members reading relevant verses from their mobile device. Clearly, the perception you get from the use of one or a combination of these modern gadgets or media tools is that they’re for convenience and productivity in the matter of evangelism. And not so much of disobedience to any stated or unstated law and statutes of God. Though members of the public doubted the claim initially but when members of the church began to cast their television set away in show of compliance, them it became a matter of genuine concern for many. People were of the opinion back then it was either a case of Christian religion orthodoxy stretched too far or a gross misconception on the part of Deeper Life members. This is not far fetched, though, because we’ve heard of members of Christian congregation from around the world who were made to do crazy stuff by their pastors. And they complied willy-nilly without deeming it wise to examine the validity or wisdom of such counsels or directives. Many years later, members of public were proved right because not only did the Deeper Life members begin to get replacements for their castaway television set; the church itself became joint forerunner in the use of more digital platforms for broadcasting their programs. Today, like many other churches in Nigeria, Deeper Life regularly live stream their programs from their Ayobo, Lagos, Headquarters to the world. And they’ve remained modest too in all their operations. What’s more? Prayers of even nontraditional members online get answered equally and continually like that of all others. And it’s all to the glory of God. The question that readily comes to mind now is that, it is wise for faithful to be overly selective or prejudicial in their adoption of technological inventions that help to promote evangelism when it cannot be sufficiently established that it constitutes harms of any kinds to the body of Christ? A crash tutorial on what constitute media variety, technological determinism and options available to the body of Christ! Media are any the channels through which information are disseminated. It ranges from the word of mouth, to walls of buildings and rocks, to clay tablets, to paper, to instruments like drums, and gongs, to machines like radio and television, and to the ubiquitous like Internet enabled mobile phones and computers etc. Media circles start from the moment anybody feels the urge to share a piece of information. It’s followed by the designing of the message with choice of words which give cognizance to the demographic and psychographic natures of the audience. The third leg involves determining the channel through which the message will be convey which can be the word of mouth or any of the numerous others as chosen by the messenger. The fourth leg is the reception of the message by the target audience. Information circle is completed when the receiver of the message is able to make a meaning out of it and feedback is conveyed. It must be stated clearly that information circle or process is complicated and continuous. Each of the medium mentioned above signifies different stages of human technological advancement. Technological determinism is a reductionist theory that aims to provide a causative link between technology and a society's nature. It tries to explain as to whom or what could’ve a controlling power in human affairs. The theory questions the degree to which human thought or action is influenced by technological factors. The term "Technological Determinism” was propounded by Thorstein Veblen and this theory revolves around the proposition that technology in any given society defines its nature. Technology is viewed as a driving force of culture in a society and it determines its course of history. German sociologist Karl Marx believed that technological progress leads to newer ways of production in a society and this ultimately influenced the cultural, political and economic aspects of a society, thereby inevitably changing the society itself. He explained this statement with the example of how a feudal society that used a hand mill slowly changed into an industrial capitalist society with the introduction of the steam mill. That the technology of a given society is a fundamental influencer of the various ways in which a society exists. That changes in technology are the primary and most important source that leads to change in the society. An off shoot of the above hypotheses which is not too extreme is the belief that technology influences the various ways choices that we make and therefore a changed society can be traced back to changed technology. From the above narrative, the idea that sticks out is that the bible is a piece of inspired information which God has purposed to communicate to humanity as a perpetual statutes for them and the medium available then technologically was the paper scrolls. And that’s exactly what he makes use of. He couldn’t have used any other means not relevant to the time. Besides, they don’t exist. Doing that could’ve meant God courting failure. And our God is not a God of failure. But as civilization progresses, the media available to man and God expanded to include radio, television and Internet for the propagation of his word and kingdom. And he’s today using them to his greatest advantage. Perhaps you’re not seeing it because you’re not perceptible enough or you’re deliberately not looking. They, however, by no means relegated the paper to the background as an enduring medium of information dissemination. To put it more accurately, the scope of information dissemination has expanded to include hard and soft copy of instructional materials like the bible for our perpetual education and spiritual renewal. Today as ever, all of the above media of information are used concurrently with one another for effect. So, the paper is by no means superior to others or vice visa. And so today, we’ve among others the option of reading our God through his creations onwards. Trust me: nothing can be more excellent. But what’s wrong if the same inspired material is made available to the body of Christ alternatively in soft copy to what we already have as hard copy. The one fact everybody both the fundamentalists and liberals must take to heart is that our God, evidently, is the master technologist and we’re only imitating him. And the earlier we understand his mindset in all of these, the more we won’t be engaging in fruitless arguments and posturing as regards which is most acceptable or not for worship or God between bible in hard or soft copy.